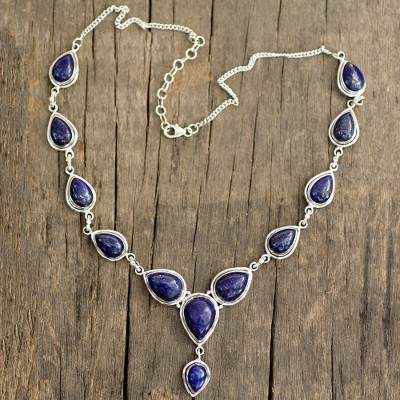 Lapis Lazuli and Sterling Silver Necklace from India, "Aura of Beauty"
Lapis lazuli emanates a deep blue mystique, bringing an aura of beauty to this elegant necklace. Designed by Neeru Goel, it sets the gemstone teardrops in silver for a delightfully feminine look. You can find lapis lazuli Y-necklace 'Aura of Beauty' by Neeru Goel in jewelry categories such as Birthstone Necklaces, Lapis Lazuli Necklaces, Silver Necklaces, Sterling Silver Necklaces and Y Necklace Necklaces. Enjoy exploring these sections for other Novica treasures. Classy Dramatic Jewelry Looks Sophisticated Silver So Elegant Wow Gorgeous! "This necklace has a "wow factor" "
The reason I say this necklace has a "wow factor" is because it is not gaudy and large, and it is not so small it is obscured by the flaws of the human anatomy. The Lapis Lazuli has a deep blue color which almost resembles a rich sapphire, however, the Lapis Lazuli has unique gold flecks of color sparkling out of the blue. The setting is crafted out of sterling silver and the deep blue gems stones against the sterling silver setting are stunning! The necklace lays on the Décolletage perfectly and its juxtaposition to the clothing line is most pleasing..
"Prettier in the Hand than in the Picture"
This necklace was very nicely made. The craftsmanship is excellent! The gemstones are beautiful. The recipient was thrilled to receive it, and I am pleased with the result! This is just perfect. Such a lovely addition to my jewelry collection!! This has become one of my favorite pieces. Well made necklack, and can dress up or down. Purchased for a friends 50th Birthday now I want to keep it for myself! Love this piece it has just the right weight to it perfect color simple yet classy. Great craftsmanship this piece will last love the gold flecks in the lapis just simply a beautiful necklace.